Crew: Kim Hollamby, Piers du Pre & Howard Jones. Port engine start hours: 319.5. Finish hours: 321.7. Hours run: 2.2. Stbd engine start hours: 318.1. Finish hours: 320.1. Hours run: 2.0. Log start: 3443.5nm. Log finish: 3457.1. Distance run: 13.6. 1123: arrive Fretherne and moor on bank upstream of bridge. 1420: KH drop off onto bank at Pegthorne for photographs. Then back onboard. 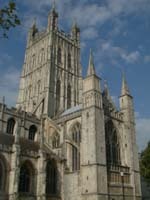 1551: Gloucester. Moored on concrete lighter next to the National Waterways Museum. An easier day was in prospect and to be frank it felt like one was due, having spent quite a few days now covering a lot of mileage in more ways than one. There’s nothing like a placid inland waterway to smooth off any ragged edges and so all aboard Missing Link were of a frame of mind to appreciate the Gloucester-Sharpness Canal, especially as we only saw about three boats moving all day. Originally designed to bypass the Severn Estuary, which dries to a mere trickle at low water, the canal was completed in 1827 and was still catering for ships as large as 5000-tonnes until recent times. However, its main trade these days is in the movement of craft carrying cargoes of leisure-seekers. As we left Sharpness, the immediate view from the grandstand perch afforded by the combined height of Missing Link‘s flybridge and the elevation of the canal was of the Severn below, its alleyways of rapidly ebbing water zig-zagging between sandbars and mudflats. Soon afterwards we passed through the lonely pillars of a railway bridge that met its demise in the 1950s. A petrol tanker was so intent on racing its partner to the lock, that it missed Sharpness in the fog and found out just how loud a bang its cargo would make when colliding with what was also a convenient means of carrying gas from one shore to the other. Deemed uneconomic to repair, the only visible remains of the bridge these days are stone piers either side of the canal and the barest hint of steel structures below the high water mark. Although its banks are steel-bordered, the canal is more rural than the first time visitor might expect, straight in parts but not uninteresting, and punctuated at regular intervals by low-lying bridges which swing to let craft through. All of the mostly hand-wound bridges are manned and we took time out at Fretherne to talk with keeper Ken Hill, better known by all as Dasher. He carries the kind of twinkle in his eye that tells you he has seen it all and knows just a little bit more again in the most unassuming of ways. Dasher is one of an increasingly exclusive band of part-time fishermen on the Severn Estuary who stand leg-deep on sandbars with nets resembling giant lacrosse sticks. A skill passed down through generations tells him how to spot the tell-tale signs in the opaque fast moving waters that a salmon is trying to take a shortcut across the bank. 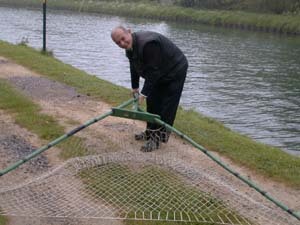 If one is seen, the idea is to chase forward with the net to cut the fish off at the pass and scoop it up. Years ago it would not have been uncommon for Dasher to have got up at 3.30am and captured up to eight prime salmon by the time it came to wade back ashore for work. Now he sometimes struggles to catch one. He is not sure why this might be, although he suspects that the salmon stock may be suffering at the hands of the predatory zander, a pointlessly aggressive non-native breed of fish that has established a hold on the upper reaches of the Severn and invaded the canal also. Whilst Howard and Kim were passing an easy hour enchanted by Dasher’s tradition-soaked stories of life on the waterway, Piers had taken off to the nearby village of Frampton, a man on a mission. His ears had detected mention of top class locally produced bacon and he needed no second bidding. Sure enough the eager crewman appeared, steaming from his gallop back in the drizzly conditions. His hand was clutching a bag containing six duck eggs, six chicken eggs, nine gammonesque rashers of bacon and three tomatoes. All bar the chicken eggs quickly found themselves cooking in Missing Link‘s frying pan to make the most perfect of English breakfasts, albeit one which would be eaten more like an early lunch. 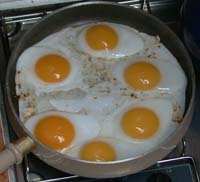 How on earth ducks manage to produce eggs of the size we enjoyed was the matter of some speculation; no wonder they quack. Confusion became even greater soon after getting underway again. Our local knowledge, Howard, alarmed his fellow travellers somewhat when he started to point out an initiative for psychopaths. It took more than a few seconds staring at the towpath with alacrity before it was realised that the work in question was more appropriate to people on their cycles than for those completely off their trolleys. After that, the remainder of the run passed easily enough. A gradual changing of the scenery from countryside to urban marked the approach to Gloucester. Then we were through the last bridge and into the arena of the Docks, its borders guarded by tall warehouses once busy with cargoes, then sadly derelict, and now thankfully restored with due regard for the original character of the place. Missing Link‘s berth for the night was snug alongside a World War II concrete lighter in an arm right next door to the National Waterway Museum. Our late arrival meant only the most fleeting of visits to this fascinating place and we invested most of that time staring with fascination at a film about the Gloucester-Sharpness Canal in the heyday of its post-war working glory. Not wishing to outstay our welcome and with a pressing need to find some victuals, we scuttled off on the short walk to the town centre. Britain’s patron saint of food and underwear, St Michael, did the honours for us in the former department with seconds to spare. We were about to retrace our steps when the sight of the commanding cathedral made us turn and walk close enough to hear the strains of evensong flowing through an open door, the aural and written invitations drawing us within. Sat still in the nave, the sounds of music, of prayers and of silence filling our ears, there could be no better way to conclude a peaceful day.